ASP.NET Hosting: Hosts That Might Change Your Mind About Windows Hosting Now. To build and deploy applications, it’s important for programmers and developers to utilize the best, most reliable hosting available. That&’s probably true for any kind of development project, but when it comes to ASP.NET projects, in particular, there are so many choices available that it can be confusing to select just one. Selecting the right hosting option for your needs requires a basic understanding of the ASP.NET framework and what the implications of using the framework are for your project&’s needs. In this article, you’ll learn what to look for in an ASP.NET host. And I’ll share my personal recommendations to give you a headstart in your search. ASP.NET is a Web application framework developed by Microsoft. However, unlike most things coming out of Redmond, ASP.NET is an open-source framework. In a move welcomed by most (if not all) developers, the company made the .NET core open source in November 2014. ASP.NET is a server-side framework that enables programmers to build dynamic websites, services, and applications. ASP.NET pages are officially referred to as Web Forms, although developers tend to dispense with formalities. ASP.NET is object-oriented and allows for inheritance, as well as for template-based page development. It basically streamlines the development process. This, in turn, enables developers to use less code to get the job done. The framework also makes ample use of server-side caching, which can be used to store different objects across the application. ASP and ASP.NET are not the same things. ASP.NET supports a number of programming languages on the framework. However, ASP.NET itself is not a programing language. Classic ASP (Active Server Pages) was Microsoft&’s first server-side scripting language. The company released ASP.NET in 2002 as its successor. Who's Best for ASP.NET Hosting? We think A2 Hosting is the best choice for ASP.NET. Using ASP.NET to build web applications, developers can isolate applications running on the same server by using the application pool. This prevents problems in one application from affecting others. Isolation also allows developers to apply different levels of security to individual web applications, depending on their specific needs. To run ASP.NET applications, one can use mod_mono which supports Apache hosting. This is the recommended way to web deploy ASP.NET applications. ASP.NET MVC is an alternative way to build web applications with ASP.NET. It doesn’t replace ASP.NET Web Forms, it simply uses a different architectural pattern. MVC stands for Model-View-Controller. This architectural pattern separates an application into three pieces. These components are the model, view, and the controller. This separation of concerns makes it easier to manage complex applications. One example of an application built on ASP.NET is BlogEngine.NET. This is an open-source blogging platform that takes advantage of .NET features. While ASP.NET is an open source framework, it is designed with the .NET framework and Microsoft Internet Information Services (IIS) in mind. Fortunately, Microsoft’s .NET core is now open source as well. Hosting companies tend to offer a number of options for ASP.NET, ranging from inexpensive shared plans to pricier dedicated-server plans. One of Microsoft’s primary design considerations for ASP.NET was to gain market share from competitor script-based frameworks by delivering superior performance benefits. This is done by compiling the server-side code to DLL files, allowing the use of a common language runtime that provides a performance boost over other scripting languages. Microsoft tried to offer the best of both worlds by combining the performance boost made possible by fully compiled binaries with the ease of use provided by scripting languages. The current version of ASP.NET is 4.5, released in 2012 along with Visual Studio 2012 and .NET 4.5. The 4.0 version is still officially supported, but it’s more than four years old and on its way out. Due to ASP.NET&’s popularity, there is no shortage of hosting plans suitable for working with this framework. What Types of ASP.NET Hosting Plans are Available? Hosting plans for ASP.NET may range from a few dollars a month to hundreds of dollars, depending on features and what your needs are. They range from basic shared hosting to dedicated server hosting. What Does a Basic ASP.NET Hosting Plan Cost? The most basic plans start at a few dollars a month and are designed to host one or more websites. More elaborate shared plans include hosting an unlimited number of websites, with abundant storage and more bandwidth. On the other end of the spectrum, dedicated servers are available, usually at a price range between $150 and $400. Without any serious digression, let’s jump straight into showcasing noteworthy features of dedicated ASP.NET hosting plans. ASP.NET can run on both Windows servers and Linux servers. So, don&’t feel confined to a Windows host, although Windows hosting plans will be optimized for ASP.NET websites and applications. Your host will need an SQL server database, such as MySQL, to be able to host applications built using ASP.NET. You can find some specialized ASP.NET web hosts out there, such as DiscountASP.NET. This company provides web hosting specifically for ASP.NET websites and applications and includes MSSQL/MySQL databases and isolated application pools. Keep in mind that this specific host company is geared primarily towards developers. 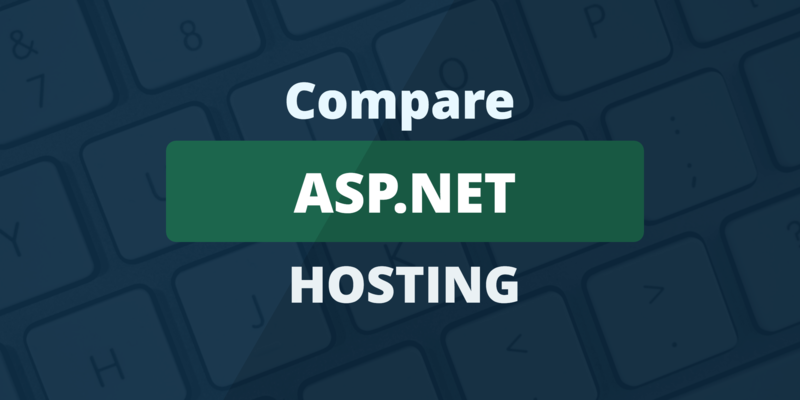 You can also find ASP.NET hosting from most common web host providers, such as HostGator and A2 Hosting. While most hosts offer the latest versions of all relevant frameworks, it is always a good idea to check before committing to their package. Here are a few pointers to guide you. Check whether the host you are considering has a good track record when it comes to software updates. Do your homework on any hosting company you are considering. Ensure that all the necessary versions are supported, not just the latest version of ASP.NET. Look for hosts that offer this level of choice; it can be quite useful. Make sure the MSSQL edition supported by your host matches that found in your application. Check the OS version(s) supported by the host. This will typically be Windows Server 2012R2 or Windows Server 2012. Trust levels for ASP.NET are related to security and are defined by policy files. Available trust levels are: Full, High, Medium, Low, and Minimal. The trust level that will be available to you will depend on the type of hosting you choose. Tip: Search the knowledgeable of the host you are interested in for more information on how they handle trust levels. Check the availability of add-ons you may need now or in the future. Check for access to easy-to-use popular control panels like Plesk or cPanel. As always, hardware requirements depend on your needs. Make sure you gather your requirements before vetting a host. Check and make sure their tech matches the requirements. You also want to ensure your hosting provider can scale its solutions for you and keep up with demand. So if you are building a site that could experience rapid growth, make sure to inquire about the possibility of adding more RAM, SSD storage or migrating to a better plan. Good tech support is equally important. However, there is one additional point to consider: If you are not new to the business, already use Linux-based LAMP plans, and are happy with the level of support provided by your host, that does not necessarily mean you will get the same quality of tech support when it comes to Microsoft technology. Excellence in one area does not necessarily translate to excellence in the other. Basically, if your current host specializes in LAMP plans and offers a few Windows plans on the side, this may be a red flag. If this is the case, make sure to check the host’s track record on the Windows front, too. It’s time. Knowing or even having a vague idea of which hosting provider to go for will aid your decision to come. One of the most affordable web hosting companies for ASP.NET support is A2 Hosting. Their windows shared hosting plans are optimized for ASP, ASP.NET, and Microsoft SQL. These plans include access to the Plesk control panel and provide you with unlimited disk space and bandwidth. One thing we love about A2 Hosting is their anytime money-back guarantee that lets you host them risk-free. HostGator gives you access to the same features and benefits offered by A2&’s windows hosting plan. Their prices are also fairly similar. HostGator includes free one-click installations of ASP.NET-friendly scripts. However, HostGator does not offer the 20x speed boots that A2 Hosting offers with their optional Turbo Servers. Another hosting option to consider is GoDaddy . We like that this popular company gives you free domain registration with their plans. However, you&’ll pay a bit more for unlimited resources and databases that you would with A2 and HostGator. GoDaddy plans will also give you easy one-click installations of applications through their user-friendly control panel. Moreover, the company stresses server security, offering 24/7 monitoring and DDoS attack protection. All three of these hosting companies offer you a 99.9% uptime guarantee, so functionally, there isn&’t a lot of difference between them. My bottom line recommendation is to examine carefully the independent reviews for each company you&’re considering. Then select the hosting provider with the best overall reviews and customer support. ASP.NET is an Open Source web application framework for developing dynamic websites, services, and apps. What operating systems does ASP.NET work on? ASP.NET only works on Windows IIS. Can I run an ASP.NET application on Linux? What languages can be used in ASP.NET applications? ASP.NET can be used to create HTML, CSS, JS, XML, and any other client-side markup or scripting language. ASP.NET uses the Common Language Runtime infrastructure, which means that server-side programming can be done in any of the CLI languages. These include C#, Visual Basic, and C++. The original ASP (Active Server Pages) was an early web development framework released by Microsoft in the mid-1990s. Programming was done mostly in the VBscript or JScript languages, with other languages being made available through third-party engines. ASP.NET is an entirely new (in 2002, that is) web development framework built on their .NET platform. How are ASP.NET applications structured? ASP.NET applications can be built using any number of coding paradigms. Microsoft recommends a code organization strategy they call the “code behind” model, where template code is held in .aspx files, with functional code in separate files with doubled extensions (like .aspx.cs) and the same base file name as the templates they are associated with. User controls that have an associated GUI are thus created using a markup file that stores presentational information and controller files. Controllers used internally do not have separate markup files but are compiled into DLLs (dynamically linked libraries) for consumption by other application code. How are states handled in ASP.NET? The web is an inherently stateless environment, so every application framework has to find its own solution to persisting state through a user session. ASP.NET offers multiple options. Developers can take advantage of Application State features, which are persistent global variables accessible to all users. Session variables, specific to a user, can be managed in several ways. They can be stored in memory on the server, outside the ASP.NET process, within the larger .NET structure. They can also be stored in the database, which provides persistence across clustered architecture at the cost of slowing down access. Alternatively, session variables can be handled in more conventional ways such as browser cookies or HTTP request variables. What are the benefits of using ASP.NET compared to other web application frameworks? Most web application frameworks are built on scripting languages, and app features have to be built in that scripting language. This eliminates the ability to use other languages, or tools written in other languages. With ASP.NET, development can be done in multiple languages. This is beneficial because certain types of tasks are easier to accomplish in some languages than in others. Also, even if your development team is only going to code in a single language, DLLs, and other tools written in other languages can still be included. Moreover, web applications written in scripting languages are interpreted at run time. ASP.NET code is compiled, which makes it run much faster than interpreted code. Are there disadvantages to using ASP.NET instead of application frameworks like Ruby or PHP? ASP.NET only runs on Microsoft servers, so if you start down the road with it, you’ll be tied to paying for your operating system and web server forever. This commitment can significantly increase the lifetime cost of your project. Another issue is that, as compared to more “fun” tools like Ruby on Rails or Node.js, it may be harder to find qualified developers over time, because the bulk of the talent tends to gravitate to more popular languages. Are there any alternatives to ASP.NET? There are a number of web application development frameworks available. Most of them — like Ruby on Rails, Django (Python), and Zend (PHP) — require all or most programming be done in a single language and rely on scripting rather than compiled code. For these reasons, most of the popular web development frameworks are not functionally equivalent alternatives. Maverick.NET is an MVC framework for .NET applications. The Entity Framework is an alternative to ASP.NET, from Microsoft, which also runs on the .NET platform. ASP.NET MVC is an Open Source framework also made by Microsoft, which extends the platform to include MVC features. When is ASP.NET a good platform choice? ASP.NET is a good option for building complex web applications that need to interact heavily with existing Microsoft components. Typically, a certain level of operational complexity needs to be required before ASP.NET is a better option than simpler web development frameworks. ASP.NET is a good platform for engineers who have a lot of experience with building desktop applications in a Windows environment, and relatively little experience doing web applications development.